This is something special: An exquisite solid silver keepsake box which is handcrafted in northern Spain into the shape of the scallop shell / concha de vieira, the symbol of the Camino de Santiago. The 1,000-year-old Way of St. James (El Camino de Santiago - in Spanish), criss-crosses Western Europe, arriving at Santiago de Compostela in Northern Spain on the Atlantic coast. At least 200,000 people travel the Camino each year from all over the world: Some people walk, others travel by bike. Many travellers choose to do the Camino for personal, rather than any spiritual or religious reasons - taking time out from their busy/modern lives and perhaps finding inspiration along the way, whilst reflecting on their life in a supportive environment. 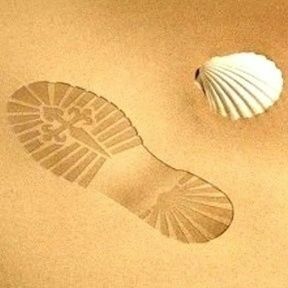 Many carry with them a Scallop Shell symbol shaped like this. Everyone experiences the journey in a different way. This would make a truly inspirational Christening present for the new baby, or perfect to store a lock of hair or to use for the Tooth Fairy. A gift with real meaning that would make a parent proud. 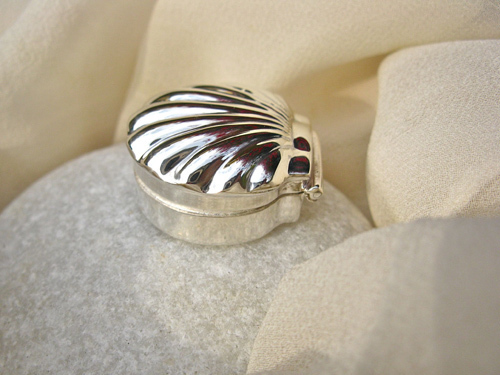 Dimensions: The sterling silver box measures 28 x 30mm and 15mm high and closes with a hinged scallop shaped lid.